Second Language Learning Theories is a clear and concise overview of the field of second language acquisition (SLA) theories. Written by a team of leading academics working in different SLA specialisms, this book provides expert analysis of the main theories from multiple perspectives to offer a broad and balanced introduction to the topic. The book covers all the main theoretical perspectives currently active in the SLA field and sets them in a broader perspective per chapter, e.g. linguistic, cognitive or sociolinguistic. Each chapter examines how various theories view language, the learner, and the acquisition process. Summaries of key studies and examples of data relating to a variety of languages illustrate the different theoretical perspectives. Each chapter concludes with an evaluative summary of the theories discussed. This third edition has been thoroughly updated to reflect the very latest research in the field of SLA. This third edition takes account of the significant developments that have taken place in the field in recent years. 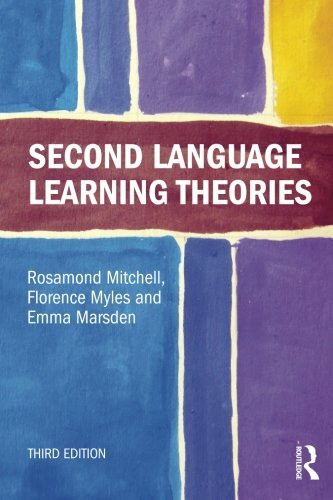 Highly active domains in which theoretical and methodological advances have been made are treated in more depth to ensure that this new edition of Second Language Learning Theories remains as fresh and relevant as ever. View More In Words, Language & Grammar. If you have any questions about this product by Routledge, contact us by completing and submitting the form below. If you are looking for a specif part number, please include it with your message.